What Is Reckless Driving in Indiana? Reckless driving occurs when a driver has disregard for the safety of other drivers or the property of others. Examples of reckless driving include driving too fast or too slowly, passing in an unsafe manner and not stopping when a school bus driver has extended the arm signal device that tells drivers a student is exiting or entering the bus. Although reckless driving endangers others, it can also have serious consequences for a driver convicted of the charge. Reckless driving in the state of Indiana can result in the driver being charged with a Class A misdemeanor or a Class B misdemeanor, depending on the severity of the case. This may mean license suspensions, fines and even prison time. According to Indiana Code 9-21-8-52, someone who drives a vehicle is reckless if he or she drives at a speed that is either unreasonably high or unreasonably low, though no specific speed is listed in the code. The person also must be compromising the safety of others or endangering others' property, as well as blocking what the state considers proper flow of traffic. If the driver is found to have been reckless while driving, he or she can be charged with a Class B misdemeanor, according to the Indiana code. What is a Misdemeanor Traffic Violation? 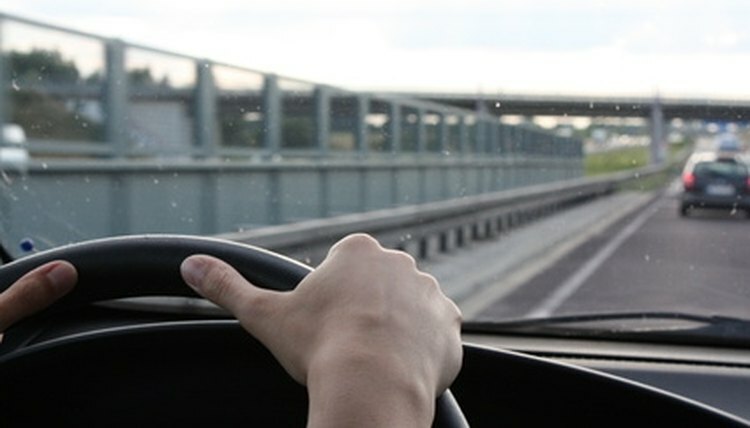 Another form of reckless driving occurs when a person who is driving a vehicle passes another when that person cannot see fewer than 500 feet ahead. This includes passing another vehicle on a curve in the roadway or along a slope, according to the code. This also can result in a driver being charged with a Class B misdemeanor. A driver also may be cited for reckless driving in Indiana if that person does not give half of the roadway to another driver who is trying to pass the first driver's vehicle. The first driver also may not speed up if he or she is being passed by another driver. This can result in a Class B misdemeanor, according to the Indiana code. Passing a school bus in a reckless manner can result in a Class B misdemeanor, or worse, a Class A misdemeanor if someone is injured due to the driver's actions. This includes passing a school bus when the bus has stopped to drop off or pick up a student and the arm signal device on the bus has been displayed. If any of these actions occur and cause damage to either another person or property, Indiana courts may recommend that the driver's license be suspended for at least 30 days, but not more than one year, according to Indiana code. According to Code 35-50-3, those charged with a Class A misdemeanor may face a prison term of up to a year, as well as fines that do not exceed $5,000. Drivers charged with a Class B misdemeanor may face a prison term of up to 180 days, as well as fines not to exceed $1,000. Courts, however, may suspend the sentences of those convicted of a misdemeanor, and those drivers would be placed on probation. That probation cannot exceed one year. According to Indiana Code, however, if someone is convicted and given a suspended sentence, and the court finds that the abuse of drugs, alcohol or other substances contributed to the offense, probation can be extended to two years. Bryant, Christine. "What Is Reckless Driving in Indiana?" , https://legalbeagle.com/6070337-reckless-driving-indiana.html. Accessed 21 April 2019. What Is Considered Child Abandonment in Washington State?